If you’re in the market for first-rate house siding in Madison, Wisconsin, or any other nearby location, turn to the pros at ABC Seamless Home Specialists. Our family-owned and operated company has been wrapping homes in seamless steel house siding since 1975, and we’re confident that our siding can help improve your home’s aesthetic appeal and energy efficiency. Seamless steel siding from ABC Seamless Home Specialists adds a clean, sophisticated look to the exterior of any home regardless of its size or style. Our siding will be custom-fabricated on site to the exact measurements of your home, eliminating unsightly, drafty seams, as well as any warps, wrinkles, or gaps that might allow insects to enter your home. This remarkable fabrication process also prevents seams that allow heat to enter in the summer or escape in the winter, potentially saving you thousands of dollars in energy costs over the life of your home. We will use heavy-duty steel to fabricate your siding, making it stronger than any other maintenance-free siding on the market. 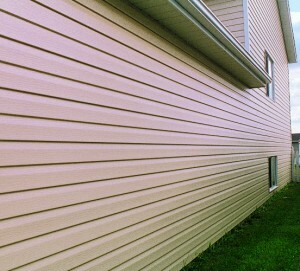 We can customize your siding with different profiles and styles to match your personal taste and aesthetic desires. As with all of our products and services, we guarantee the quality of your new house siding with a lifetime transferable warranty on the materials, plus an exclusive 20-year, 100 percent workmanship warranty. Furthermore, our seamless house siding will be installed by our staff of factory-trained professional craftsmen – we will never subcontract out our seamless siding work, so you can trust that the crew we send to work on your home is professional, trustworthy, and highly skilled. Let our family help your family by installing beautiful, sturdy, seamless steel house siding on your home in the Madison, WI, area. Contact ABC Seamless Home Specialists today to meet with one of our experts and learn more about our superior products and services.